All of the staff members at MGC have been carefully selected for their knowledge of gymnastics skills, first-class teaching ability, and above all an understanding of children. As past and present gymnasts, our staff have each experienced the challenges and rewards of the sport. 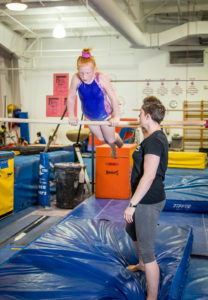 Having an in-depth gymnastics background enables each staff member to build in their students a strong gymnastics foundation using a creative and caring approach. The introduction of new skills is customized for each child. This unique methodology allows for growth, advancement, and a feeling of accomplishment in each young gymnast. At MGC, we want each child to feel a special relationship with their gymnastics coach. We believe that self-esteem is fostered by providing our gymnasts with a program structure that gives them the confidence and security needed to strive for personal achievement. By combining our nationally recognized lesson plans with a personalized positive teaching style, our dedicated staff guides each gymnast to success.